When you are away from home, it can be easy to forget to keep up with your regular oral care routine. Be it due to laziness or lack of daily structure, being someplace aside from your own bathroom can cause you to fall behind on brushing, forget to floss, or forgo other parts of your normal oral hygiene regimen. 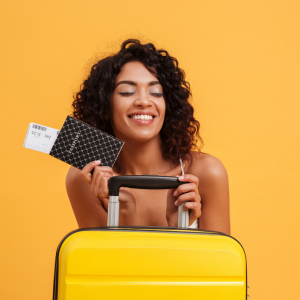 Along with keeping up with oral care, there are other travel tips to note that will keep your oral health in check while you are vacationing or away from home. Follow these on-the-go guidelines and you will be in great shape when you’re not running through the usual day-to-day drill. Oral care is so important no matter where you are or what you’re doing, so don’t let your trip trip you up. I forgot my toothbrush…now what? Packing is always a challenge, and most of us tend to leave something behind…even the essentials. If you forgot to pack your toothbrush, there is no need to panic. If you are staying at a hotel, go to the front desk and simply ask for one. More likely than not they will have a complimentary one for you in a pinch. Same goes for toothpaste. If your hotel does not have a toothbrush for you to use, there is sure to be a convenience store, supermarket, or pharmacy nearby. To avoid this common oversight, purchase a few travel-sized toothbrushes and leave them in your luggage or carry-on bag for your next trip. Better safe than sorry. Even if you remember to bring along your toothbrush, there’s a good chance that someone you are traveling with forgot theirs. Help them out so they can maintain their oral care too. Do I really need to floss while I am away? Can’t I skip it ‘til I return? Flossing is an important part of oral health. It is not advisable to skip a week or even a few days…even when you are away. In fact, when you are vacationing, you are probably more likely to indulge in foods that you normally would not eat at home. Perhaps you will give in to sticky sweets or other fare that is far more likely to get lodged between teeth, which can lead to decay. It only takes a few moments to care for your mouth. Leave the floss by the sink and get in there at least once a day while you’re away. Pack some convenient floss picks in your bag to tend to teeth during the day as well. You never know when you’re going to need one. My schedule is all over the place when I am traveling. What if I can’t brush and floss when I want/need to? dental care is just as important, but chances are that you will miss out unless you pre-plan. Take along a small toothbrush and travel-sized toothpaste in your handbag or backpack so you can brush after lunch or snacking. If you can’t find a place to get the job done discreetly, chew on a piece of sugar-free gum to stimulate saliva flow to keep your mouth cleaner ‘till you are able to brush. An apple does the trick too. Should I come in to the office for a dental exam before traveling? If you can plan ahead and schedule your general exam close to your departure date, it is a smart idea. If you have any cavities or other dental issues looming, you are best off taking care of this before heading out of town. If you require emergency care while far from home, there is no guarantee you will be able to see a dentist you can trust, one who accepts your insurance (particularly if you are traveling out of the country), or if there will be anyone available at all. You will be less worried about your oral health so you can focus on having fun. When you are on-the-go, your teeth don’t know the difference. You may want to let loose or do things differently than you do normally, but the one thing to keep up with is oral care. It only takes a few minutes to go through the motions, so make it your mission to be good to your mouth. If you want to get an oral checkup before debarking on your trip, consider scheduling a cleaning with Lifetime Dental Health! Safe travels! Dr. Barry is part of a Columbus tradition of dental comfort and care. His outstanding education and training forms the foundation which enables him to treat all of your dental needs with confidence and trust providing the best care possible. Dr. Barry received his BS from Ohio State University in 1976, he also received his DDS from Ohio State in 1980.He is continually educating himself and his staff on the newest dental techniques and approaches in order to provide you with cutting-edge, comfortable, personalized, and antiseptic dental care. Dr. Barry is educated in the following areas – Reconstructive Dentistry, TMJ, Cosmetic Dentistry, Lumineers, Invisalign, Endodontics, Botox, Juviderm, Pediatric Dentistry, Geriatric Dentistry. Monday 8:30 a.m. – 7:00 p.m.
Thursday 7:00 a.m. – 4:30 p.m.
Friday 8:00 a.m. – 4:00 p.m.